Conditional formatting is a fantastic way to quickly visualize data in a spreadsheet. With conditional formatting, you can do things like highlight dates in the next 30 days, flag data entry problems, highlight rows that contain top customers, show duplicates, and more. Excel ships with a large number of "presets" that make it easy to create new rules without formulas. However, you can also create rules with your own custom formulas. By using your own formula, you take over the condition that triggers a rule, and can apply exactly the logic you need. Formulas give you maximum power and flexibility. For example, using the "Equal to" preset, it's easy to highlight cells equal to "apple". 1. Select the cells you want to format. 3. Enter a formula that returns TRUE or FALSE. 4. Set formatting options and save the rule. We also offer video training on this topic. The above formulas all return TRUE or FALSE, so they work perfectly as a trigger for conditional formatting. When conditional formatting is applied to a range of cells, enter cell references with respect to the first row and column in the selection (i.e. the upper left cell). 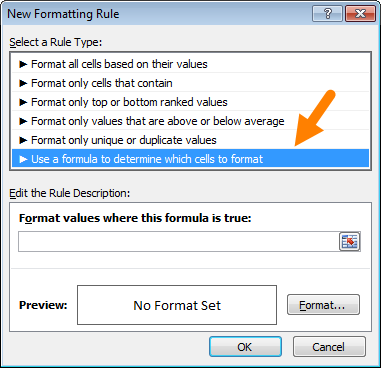 The trick to understanding how conditional formatting formulas work is to visualize the same formula being applied to each cell in the selection, with cell references updated as usual. Imagine that you entered the formula in the upper left cell of the selection, and then copied the formula across the entire selection. If you struggle with this, see the section on Dummy Formulas below. 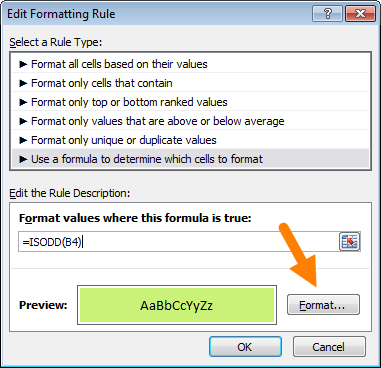 Below are examples of custom formulas you can use to apply conditional formatting. Some of these examples can be created using Excel's built-in presets for highlighting cells, but custom formulas can go far beyond presets, as you can see below. For more details, see this article: Highlight rows with conditional formatting. The NOW function returns the current date and time. For details about how this formula, works, see this article: Highlight dates in the next N days. See also: a version of this formula that uses the EXACT function to do a case-sensitive comparison. This formula simply checks each value in List A against values in the named range "list" (D5:D10). When the count is zero, the formula returns TRUE and triggers the rule, which highlights values in List A that are missing from List B. Although Excel has presets for "top values", this example shows how to do the same thing with a formula, and how formulas can be more flexible. By using a formula, we can make the worksheet interactive — when the value in F2 is updated, the rule instantly responds and highlights new values. Where "data" is the named range B4:G11, and "input" is the named range F2. This page has details and a full explanation. This article explains the formula for bars, and this article explains the formula for weekend shading. 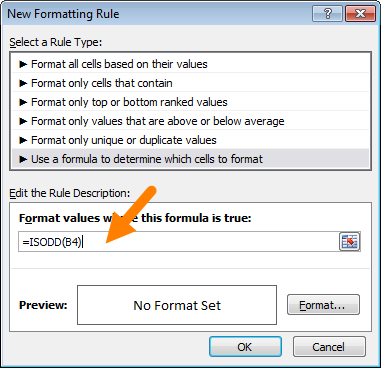 If you can't get your conditional formatting rules to fire correctly, there's most likely a problem with your formula. First, make sure you started the formula with an equals sign (=). If you forget this step, Excel will silently convert your entire formula to text, rendering it useless. To fix, just remove the double quotes Excel added at either side and make sure the formula begins with equals (=). If your formula is entered correctly, but is not triggering the rule, you may have do dig a little deeper. Normally, you can use the F9 key to check results in a formula, or use the Evaluate feature to step through a formula. Unfortunately, you can't use these tools with conditional formatting formulas, but you can use a technique called "dummy formulas". Dummy formulas are a way to test your conditional formatting formulas directly on the worksheet, so you can see what they're actually doing. This can be a big time-saver when you're struggling to get cell references working correctly. In a nutshell, you enter the same formula across a range of cells that matches the shape of your data. This let's you see the values returned by each formula, and it's great way to visualize and understand how formula-based conditional formatting works. For a detailed explanation, see this article. There are some limitations that come with formula-based conditional formatting. First, You can't apply icons, color scales, or data bars with a custom formula. You are limited to standard cell formatting, including number formats, font, fill color, and border options. Second, you can't use certain formula constructs like unions, intersections, or array constants for conditional formatting criteria. Generally, there are ways to work around these restrictions. If you see this error, and have a valid formula, you may be able to move the logic of the formula into a cell in the worksheet, then refer to that cell in the formula instead. If you are trying to use an array constant, try created a named range instead.